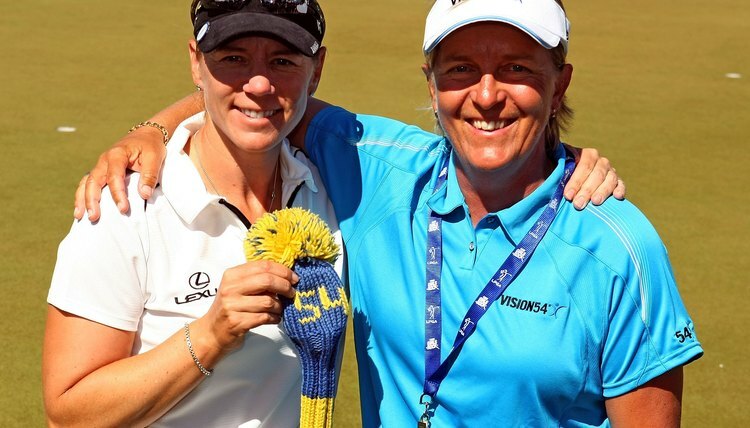 Pia Nilsson, right, worked as a mental coach for Annika Sorenstam, left. Bobby Jones once said that the game of golf is played on a five-inch course — the distance between the ears. So it is not surprising that mental training aids abound and cover a vast amount of territory. Many professional golfers hire a mental coach to help them reach their full potential, and many books, videos and DVDs explore the mental aspect of competition. You don't have to be a pro to benefit from training your mind as well as your swing. Professional golfers hire mental coaches for many reasons. Such coaches help with their on-course routines, help them control their thoughts and prepare them for the pressure of major tournaments. As reported in "Golf Digest," in 2011, Phil Mickelson hired Julie Elion as his mental coach. Elion helped him prepare for the tough conditions and often miserable weather at the British Open. Although Mickelson usually struggles at the event, he maintained his confidence and enthusiasm under difficult circumstances and tied for second in 2011 after working with Elion. Many mental training aids are used to improve the focus of a golfer. A prime example is visualization, also called mental imagery. Jack Nicklaus, for example, visualized every shot he hit, even in practice. "It's like a color movie," Nicklaus wrote. He visualized where the ball would go, its flight path and its movement upon landing. Then he visualized the type of swing necessary to produce the vision in his head. Only after completing the process did Nicklaus select a club and attempt to create his movie in real-life. Mental training for golf can enable you to know yourself better, both on and off the golf course. A number of books have been written about the benefits of self-knowledge in reaching your peak in golf or any other endeavor. Taking an inventory of your emotions and keeping a diary of your reactions to particular situations on the golf course is one recommended method of obtaining such self-knowledge. Under the direction of her mental coach, Pia Nilsson, Annika Sorenstam charted every shot she hit in competition and also focused on her emotional reactions on the course in order to work on specific weaknesses. Almost all golf mental aids are designed to help you cope with pressure, whether you are competing for the U.S. Open title or are in a $5 match with your buddies. In addition to books and videos, some very sophisticated high-tech aids are available. For example, you may buy a machine that measures your heart rhythms, a key indicator of your emotional state. Using the machine teaches you to regulate preventable stress, which may help you on and off the golf course. Does Golf Help in the Business World?